Ananka's Diary: Quick, Someone Fetch Me Some Fingerpaints! Quick, Someone Fetch Me Some Fingerpaints! A Melbourne art gallery recently agreed to show the work of a promising new artist named Aelita Andre. 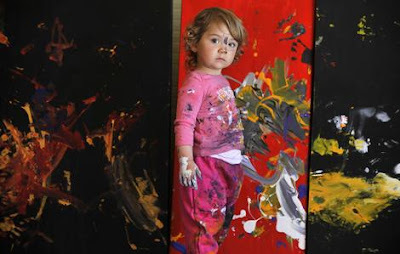 But when the artist arrived at her show's opening, gallery owners discovered that Aelita (shown above) is only two-years-old. What do you think? Are artists like Aelita geniuses? Frauds? Jokes on the art world? (The fact that this question needs to be asked really says something.) And is anyone interested in purchasing some lovely paintings created by my talented three-year-old niece, Zoe? Hmmmmmm. Kinda like Kasper in the second Kiki. Only the artist is a girl. You rock, Aelita! Kirsten: How much are you asking for your niece's paintings? When is your next book coming out(no presure)? I don't think they're geniouses; they jusst have a very special, God-given talent. Can we see a picture of Iris? Pleeeeeeease? Did you like National Treasure, Kirsten? I wouldn't say anyone's a prodigy until they can paint actual people/scenes/objects when they're that young. Anyone can smear paint on a canvas and call it art (but really, it isn't even close). Please. All kids do crap like that, some people just decide to make money off it. Its called fingerpainting. That's not saying its not cute and mildly impressive, but honestly? Psshhhhhh. Personally, I think all the paintings by toddlers or monkeys or elephants are indeed jokes on the art world. I mean, it is literally a case of "I could paint something better than that!" (And I am not a great artist!). I agree completely with Dahlia; anyone can chuck some paint at a canvas, but it takes real talent to draw something beautiful. 1.I do not think it is a fraud. Do you see where I'm going with this? Anyone at any age could buy acrilic paint, dip their fingers in it and smear it all over a canvas. Gee, why couldn't my parents sell my amazing art from my youth years and sell it for thousands of dollars... we'd be loaded. People buy almost anything. Dahlia: I agree. something like that happened once. A person painted a canvas completely white and it sold of a couple million dollars!!!! If the smear-painting actually makes you think of it as more than a smear, then it is art. But otherwise it is just a smear. I bet that the museum was awfully surprised when she showed up! You go girl! god, I hate that. Yeah, it looks kind of cool, but TWO YEAR OLDS SHOULD NOT BE PAID FOR WHAT THEY DO IN DAYCARE. One piece of "art" that really really annoyed me was in the MOM"A" (of course). I think it was this huge canvas, completely blue. Yes. plain BLUE; a single shade of it. for god's sake. wow the paintings are kind of ridiculous in my opinion. i would never pay for something so silly. but i do like Dakota Blue's idea bout zebras. ohhhh what if they did a striped car or building. btw i know every1 wants to know bout your next book, Kristen, but can you just tell what month you think it will come out. i mean, i don't want to babysit for 6 months to get the money if it doesn't even come out! They are Just like Kasper. Did he reproduce Picasso when he was 2? just to voice my opinion, her paintings arent about acccuracy, they're about expression, creativity, and artistic elements. the extrodinary thing is how she has balance and movement as well as complimenting color schemes. if you really look at the pictures and their titles, you can tell that she is painting her impression of real objects. i don't think she's a genius, but she is definetly a prodigy. Notice: the 2-year-old awesomeness is a girl. Not a boy. Girl power! DAKOTA BLUE: Zebra's painting! That's so cute! If somebody gave me a canvas and lots of paint when I was two, I'd be a millionaire by now. Even if they gave it to me at this age, I would be a millionaire! Just dip my fingers in paint... splash onto the canvas... make circles with the brush.... TADA!!! That'll be $2,000 please. Thank you come again! Honestly, anyone can do that! Who would like to purchase my drawing of scribbles? It's only a few hundreds of dollars.. I'm sure you'd love to hang it on your fridge. I have never been a fan of cat, elephant, or two-year-old human art, but that's jus a personal preference. I'd like to see her work in 8 or so years. She could be really talented. You can't really blame her not painting those pictures.. She's two. Plus, she paints abstract art. Abstract is suppose to be messy. But the messy isn't really messy... I mean, it has to be perfect. If it's not right at certain parts, the painting would make your head hurt. If it doesn't make your head hurt, it drives you crazy. But if you draw it right, it looks wonderful. Hmm... She reminds me of my friend... She won this huge award [and a $5.000 dollars prize money 8D] and was featured on the newspaper. I asked her how she won and she said "I don't know, I only drew bread..."
I guess I and the only one who disagrees with everyone else. I don't think that it is absolutely amazing, but I think that the paintings aren't just paint smeared on a canvas. Both my parents are artists so I go to shows, museums, etc. a lot. And many adults do paint that way. People like because those little kids are sort of painting in hmm.. mature way. And actually, in the video, you'd be surprised how difficult it is to make smeared paint look like that. We did it once in art class. And just finger painting and splattering don't show an actual object, it doesn't mean it's not art. I agree with Dahlia... I was making junk like that when I was 2 as well, and nobody came up to my parents offering half a million dollars! People:What you did when you were 2 is a lot differnent than what she is doing. Modern art is VERY complicated, and very hard to do. Many people do not understand it. But you try and do that, and you wont be able too. I promise. I saw the bluw picture someone was talking about in an earlier post, and the point of that picture was texture. Did you notice the intricite brush strokes? Furthermore, it takes a lot of word to change a modern picture from squiggles to art. I was looking through my book I m ade when I was young, pure squiggles. With art you have to use textures, solor schemes, shape corrolation, the list goes on and on. And I believe that the two year olds work is art. It is certainly more impprssive then anything I could do, and what does age matter anyway? It's art. So is everything. Depending upon how you look at it. But that girl's paintings are something else. I agree with you Undiscovered Universe! um, undiscovered universe, not o be rude, but you don't need to be so angry at everyone. they're just voicing their opinions of it. my opinion is it's cool. i like the paintings, but its not like i would pay 5,000 or even 500 for it. i think she should paint, hang it around the house, show people, if someone wants to buy, then cool, if not, just enjoy doing it. but i agree with Maddi about her being a prodigy, but not with Spiffy,or with Undiscovered Universe, no offense! I think that this child is a great modern artist. That being said, most of the modern art I've seen (and I've seen a lot of art) looks as if it was made by a two-year-old. I understand that art is about expressing one's self, but the paintings look like accidents, like they weren't intentional, thus not expressing anything. Jin Ai: I saw that. :( I think it's cool that they are making a statement, but honestly, there is some art that is much better that should be there. I agree that there is texture to it, but not some of them. Some it's just smooth. Oh jeez, Anonymous, your right! That post (and a lot of my others) are really rude! I don't really look over my comments, I just right what pops out of my head. I'm REALLY sorry if I ever offended anyone! And I'll try to look over my comments to make sure they aren't to mean anymore. Sorry! OKAY GUYS!! Er... GIRLS!!! Isn't this a bit pointless to fight about? Let's not equate animals with people (even if the people are two-year-olds). I think the art is cool, but I couldn't consider the kid a prodigy. Even Picasso could paint things that looked real. He developed his own distinctive style after extensive training in art. Could either of these kids paint things that look real? I really doubt it. I, personally, like toddler art, but not the abstract type so much as when what they're drawing is beginning to look real. My little siblings have drawn some amazing stuff before the age of five. My lil sis is two and she paints good no one wants to buy her paintings for 1 million $z !!!!! Sorry but I think this story is DUMB!